A duplicate is a product that appears more than once in the same location. These are separate products, but with matching information. Duplicates are usually caused when a product that already exists is created again. This can happen either in Shopventory or in the connected merchant account. Sometimes products may look like duplicates in Shopventory, but they are not duplicates. For instance, a product which is sold at two locations will show up twice in your inventory list. A product which came from two separate integrations (e.g. Square and Shopify) will also be listed independently; these may need to be merged, but they are not true duplicates. If you're still not sure where your account stands or how to proceed, please contact customer care for assistance. "Clear merchant account": The process of deleting products in each platform (Clover, Square, Shopify) varies. If you're not sure how to do this, check your provider's help documentation or consult their support team. "Merge Process": This refers to choosing one integration as your "master" inventory list. 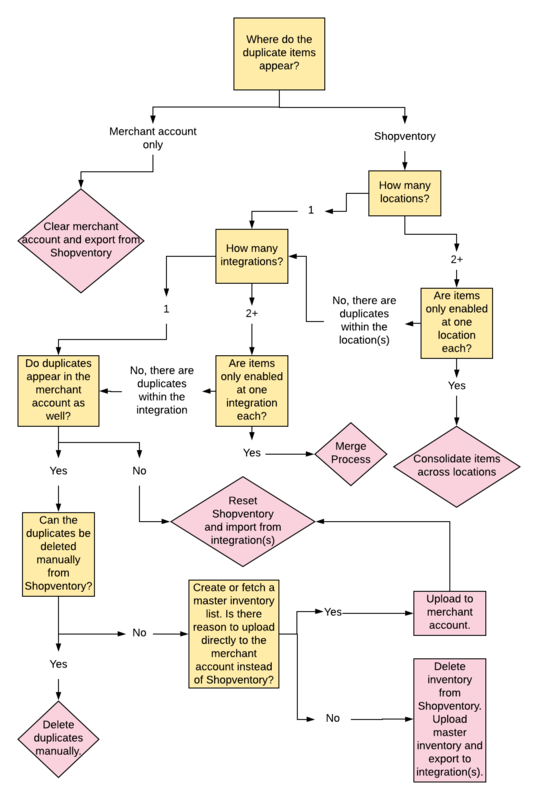 You will need to reset your Shopventory account, delete all inventory from the other integration(s), import the master list, and export from Shopventory to the other integration(s). If you need to reset your Shopventory account, please contact support for help.